What is life? A simple enough question. Yet in 1956, through the course of his relentless research, L. Ron Hubbard spoke of filling page after page with possible answers…until he had listed some five hundred potential patterns of life. And only one, the least likely of all, proved out. Thus, the conclusion—deceptive in that it seemed irrelevant, yet altogether surprising in that it was completely pervasive: Life is a game. 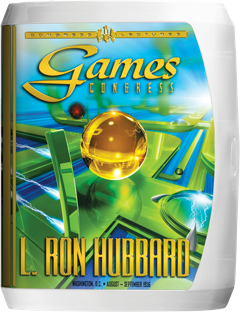 And with that news spreading through the Scientology world, with a promise of even more, it was no surprise when the Games Congress drew the largest gathering of Scientologists to date. It commenced on a holiday weekend of August 31, 1956. And while Washington DC’s Shoreham Hotel had previously seen a Scientology Congress, this one was different—requiring the vast and ornate Main Ballroom to accommodate the more than 400 attendees. And that’s not counting the six-foot “Mama and Papa” dummies with which Mr. Hubbard demonstrated Group Processing between his first description and dissection of Games. Soon the elements and rules of that game took shape: freedom, barriers, purposes—applicable to any game; The conditions defining a “game,” among them: identity, opponents, motion and emotion; Those which define a “no-game,” including: solutions, serenity and no-motion; The elements of “control”—start, change and stop; The role an individual plays in a game—self-determined or pan-determined; And even the factor of knowingly or unknowingly playing a game. But regardless of what, where and how one played, the basic rules were always the same and they explained the shape of life itself. Here, then, are the watershed lectures on the underlying reason why every earlier quest for answers failed, the discovery of why a thetan loves problems and, in turn, a brand-new approach to auditing not only to improve one’s ability to play the game, but to achieve truth itself.